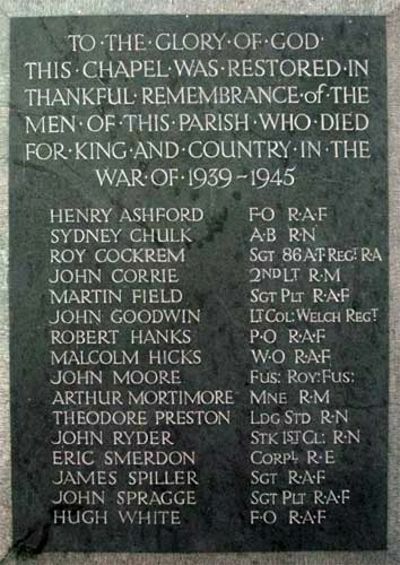 Believed to be 151215 Flying Officer Albert Henry Ashford of the RAF Volunteer Reserve, 405 Squadron (RCAF Vancouver Squadron) who died 30 January 1944. This man is referred to in the CWGC Index as Solomon Chulk - he seems to have adopted the name Sydney for himself. D/KX 84305 Leading Stoker Solomon Thomas Russell Chulk of the Royal Navy, HMS Hermione. Son of Frederick Henry and Georgina Chulk (née Hill) but brought up by his grandparents in South Brent after the death of his mother. Born in South Brent in the June Quarter of 1915 - his GRO Index entry also names him as Solomon Chulk. Died 16 June 1942 aged 28. 5623854 Lance Sergeant Roy Cockrem of 86 Anti-Tank Regiment, the Royal Artillery (5th Battalion, the Devonshire Regiment). Son of John Hewett and Mary Cockrem (née Heath) of South Brent. Born in South Brent in the June Quarter of 1917. Died 28 December 1944 aged 27. Lieut. John Malcolm Corrie of the Royal Marines, HMS Barham. Son of Captain Malcolm Wynne Gilfillan Corrie of the Royal Artillery and his wife Fanny Olive Laetitia Corrie (née Pardoe) of South Brent. Born in Winchester in the March Quarter of 1920. Died 25 November 1941 aged 21. 528040 Sergeant (Pilot) Martin Field of the RAF. Son of Martin and Emily Field of Aish, South Brent. Born in South Brent in the December Quarter of 195. Died 18 June 1940 aged 24. Martin Field was piloting a Bristol Blenheim IV on a transfer flight to the Middle East when his plane was lost in a severe storm north-west of Limoges and crashed at Crozon-sur-Vauvres. The other 2 members of the crew were also killed. 39452 Lt. Col. John Abingdon Goodwin, commanding the 6th/10th Battalion, the Royal Welch Regiment, Parachute regiment AAC. Son of John David and Marion Goodwin; husband of Dulce Beatrix Goodwin (née Collier). Born in Guildford in the June Quarter of 1918. Died 10 September 1943 aged 35 at Monte Cassino. 42706 Pilot Officer Robert Archibald Hanks of the RAF, 233 Squadron. Son of Frederick George and Zillah Hanks (née Jacobs) of South Brent. Born in South Brent in the September Quarter of 1915. Died 14 October 1940 aged 25. 523113 Warrant Officer (Observer) Frank Edward Malcolm Hicks of the RAF, 105 Squadron. Son of Albert and Caroline Hicks (née Boswarva). Born in Plymouth in the March Quarter of 1916. Died 20 October 1942 aged 26. 14419070 Fusilier John Frederick Moore of the 8th Battalion, the Royal Fusiliers (London Regiment). Son of Frederick Charles and Florence Ann of Kennington, London. Born in south-east London in 1923; his enlistment papers describe him as "brought up in Devon". Died 16 February 1944 in the Anzio landings aged 19. PLY/22647 Marine Arthur Ernest Mortimore of the Royal Marines, HMS Exeter. Son of John Mortimore of South Brent; husband of Olive M Mortimore of South Brent. Born in Staverton 9 August 1905. Enlisted 18 May 1925. Died 2 February 1945 aged 40 as a Japanese prisoner of war. D/LX 26779 Leading Steward Theodore Lawrence Preston of the Royal Navy, HMS Punjabi. Son of Frederick and Mabel Rose Preston of South Brent; husband of Elsie Frances Preston (née Cannon) of South Brent. Born in South Brent in the March Quarter of 1904. Died 1 May 1942 aged 38, missing presumed killed when his ship was lost. D/K 21543 Stoker 1st Class John Robert Ryder of the Royal Navy, HMS Courageous. Son of John and Louisa Ryder of South Brent. Born in South Brent 6 December 1895. Died 17 September 1939 aged 43, missing presumed killed when his ship was lost. 2130604 Sapper James William Eric Smerdon of the Royal Engineers. Son of James and Elizabeth Smerdon (née Head); husband of Molly Kathleen Smerdon (née Davey) of Bridgetown, Totnes. Born in South Brent in the June Quarter of 1909. Died 6 June 1944 aged 35. 1586438 Sergeant John William James Spiller of the RAF VR. Son of Francis Gilbert and Edith May Spiller (née Crocker) of South Brent. Born in the Totnes area in the September Quarter of 1923. Died 24 April 1944 aged 20. Remembered on the Ottowa War Memorial. 1380461 Sergeant Pilot John Charles Spragge of the RAF VR, No 15 Officer Training Unit. Son of Captain Charles Henry and his wife Charlotte Renee Spragge (née Peerson) of Great Ash, South Brent. Born in 1922. Died 14 October 1941 aged 19. 49590 Flt. Lt. Hugh Cecil Lovat White of the RAF, 99 Squadron. Son of Captain C E Hughes White, DSO; DSC; RN and his wife Mary S M Hughes White (née Armstrong) of South Brent. Born in Portsmouth in the June Quarter of 1920. Died 1 January 1945 aged 24. Commemorated at Singapore.